- Your Association is highly involved in interreligious dialogue, above all between Judaism, Christianity and Islam. What is the basis for this dialogue, do you recognize a common root between the three monotheisms? Dr. Oktar BABUNA: My name is Oktar Babuna. Shalom to all our viewers and hello. I am a neurosurgeon, brain surgeon and I am representing Mr. Adnan Oktar who is a Muslim author who has written more than 300 books in 73 languages, has thousands of websites and a TV channel, A9 TV, and he does TV programs everyday. So we are a voluntary organization. Mr. Oktar has been struggling for 35 years intellectually to spread the truth of monotheistic religions. What I mean by that? We believe in the same God, these are Abrahamic religions; Judaism, Christianity and Islam. We believe in the same God, we love the same prophets. So this is more than a dialogue, this is what he means by that. Actually he has a book about this. A Call for Unity. Unity, alliance of Judaism, Christianity and Islam to solve the problems in the Middle East especially. The deep rooted problems of these conflicts, divisions, and internal conflicts and the hatred and enmity. Actually according to Islam Jews are regarded as the People of the Book. There must be a love, great love for Jews and compassion for Christians, and even for unbelievers. If unbelievers ask for protection, God says to the Muslims in the Qur'an that they have to be protected. God says, “Bring them to secure place even though you risk your own life.” The cause of this enmity and hatred is radicalism which is based on superstitions which are not in the Qur’an. In the Qur'an there is mercy, love, respect for Jews who are the People of the Book, and for Christians. Muslims are even allowed to marry them; Prophet Muhammad had a Jewish wife. Usually these radicals never talk about these. So Mr. Adnan Oktar does an intellectual struggle to spread these views in the Islamic world because radicalism and fanaticism – nobody is born a fanatic, of course. They learn this in their families, in their mosques, in their religious schools. So we have to carry out a counter education intellectually through the books, websites, TV programs to educate these people about real Islam, about what God says in the Qur'an. In that way we can live in peace and security and in fact Mr. Oktar is the first to reflect these views actually from the Qur'an. There are four verses in the Qur'an in which God says, “I settled the Children of Israel in the Holy Land” Holy Land is Israel as you know. And God says that they will be there until the Hereafter. Four verses.. So Children of Israel has the right to live as an independent state until the Last Day together with Christians, Muslims all in peace. So what needs to be done is an intellectual education to change these radical views with a counter education. This way there will be peace. Then let’s ally together, Jews, Christians and Muslims. - In last years Turkey had a lot of problems with Israel and EU. Do you think that the interreligious dialogue must exceed also the political problems? Dr. Oktar BABUNA: Mr. Adnan Oktar did TV programs together with the Jewish politicians from Israel many times and many Rabbis including for instance Rabbi Meir Lau, he is a very respected Rabbi all around the world and many other Rabbis. Sanhedrin Rabbis came to his tv shows many times. So he gives messages together friendly with the Rabbis and Jewish people and politicians, very peaceful messages. When there was tension after the Mavi Marmara incident between Turkey and Israel, Mr. Adnan Oktar played a very important role to mediate between Israel and Turkey. Actually the problem was among the politicians. Turkish nation has a great love for Jews. As you might remember in the time of the Ottoman Empire in 1492, Sultan Bayazid sent his ships and brought our Jewish brothers and sisters with these ships to Turkey and we lived in peace for a very long time. This is what Islam tells us actually. So right after the Marmara incident Mr. Oktar sent me and another friend of mine to Israel and he sent a message that Israel can issue an apology and that would not humiliate Israel, and actually it will make it bigger. And pay for compensation. The compensation - and we also brought this message to Israel- exists in Judaism. Everybody agreed with it. We had a meeting with Mr. Rivlin, who is the President right now, we had a meeting with party members, with Minister of Internal Affairs, at that time Mr. Yishai was the Minister of Internal Affairs, with the Chief Rabbi Amar and we had meeting with the Likud party members and other members of the parliament. Everybody agreed. It has taken some time, so we brought the politicians to Turkey, to TV programs about this issue. Finally the problem was solved. Israel is a very close ally of Turkey. Turkey needs Israel in the region, and Israel needs Turkey against radicalism, terrorism and violence. Our brothers and sisters live in Israel actually. Turkish nation has a great love for Jews. So we want them to come to Turkey freely and settle wherever they would like to, live together. Insha’Allah this is our aim. Israel is under the protection of God and Turkey will definitely help. As Mr. Adnan Oktar says, if anybody has any bad thoughts about Israel, as you know there were statements in the Middle East, for example like “eradicating Israel from the map”, he said, “We will bring the Dome down to their head.” We will never allow something like this. There was a fire as you might remember in Israel, Mr. Erdoğan sent airplanes to extinguish the fire immediately. So we love Israel. Israel is our national ally, and brother-sister country of Turkey. Let’s come together. Turkey, Israel and other countries, Russia also against terrorism, radicalism in the region and solve these problems. Turkey wants to be part of Europe. Of course Mr. Adnan Oktar always tells in his TV programs, the level of quality in the Middle East is low. Turkey is better in terms of that but still in the terms of arts, aesthetics, science, we have to increase the quality. We applied to EU in 1955 actually, at the very beginning, it was not the EU then, it was an economic union actually. For 58 years, Turkey has been waiting to be accepted to the EU but the thing is, of course, although the majority is not like this in Turkey, there are some radical people existing in Turkey also, they have radical views, they are against arts. Some Orthodox Muslims, they are against science, arts, aesthetics and the values of Europe. So if you are against the values of Europe, if you are against their dance, their music, their -for example women’s deep cut dresses, their make-up, very elegantly dressed – and also arts and science and aesthetics, if you are against their values, why should they take you then? But in fact in the subconscious of these people, although they are radical, they are Orthodox, although they say they believe in that, these people send their children for education to Italy, to the UK, to the USA, to Germany. Why don’t you send your children to Yemen or other countries like Pakistan, Afghanistan? You know what I am saying? In the subconscious mind they admire the values of Europe actually. So we want to be a part of Europe, we did not move away from the West, definitely not, but Turkey also have good relations with Russia and the neighboring countries. This is the policy of Turkey. Israel is very important for Turkey, of course. And we want to have good relations with everybody. We want to be a part of the EU but we have increase the quality in Turkey. Mr. Adnan Oktar recommends the government and other people all the time. Actually he said, “There should be a Ministry on quality in Turkey.” We see terrible statues around Turkey and there are people against arts; we have to educate these people, of course. Because according to the Qur'an Islam there is nothing against arts, science or aesthetics. Actually Islam recommends to study science so that we can see the evidences of Creation. Art is a blessing of God, of course. And in that way we can be a part of EU. Of course we want a better democracy in Turkey. Turkey is a very democratic country, the best in the Middle East actually among the Muslim countries. There is secularism in Turkey. Everybody has the freedom of worship and freedom of thought in Turkey but we want it to be better, of course. Of course there are some defects but we want to better that. Years ago Mr. Adnan Oktar wrote two books, Judaism and Freemasonry and the Holocaust Lies where we can find the traditional prejudices against Jews. What has changed since that time? Dr. Oktar BABUNA: Mr. Adnan Oktar was asked this question many times. First he says that anti-Semitism is haram. Haram means “unlawful.” According to the Qur'an, you cannot be anti-Semitic. It is definitely unlawful, God says. So he was never anti-Semitic. In the Book of the Free-Masonry and Judaism, if you read this book, he mentions in this book, not the religious Jews or the religious people, he criticizes the unbeliever aspect, irreligious activities of the Freemasonry and some Jews. Of course there are some Muslims for example they call themselves Muslims, but they support atheistic philosophies, and they are not believers. And these people are also criticizing the Qur'an as you know. So it is not peculiar to Jews. Although the title says “Jews”, it is not the Judaism. It is not the Jews, religious or good people. Only whenever they act for example in a terrorist way or against the laws, and these people are criticized in the Torah also, right? God says that He will give trouble if stay away from religion. God warns the Jews. God also warns Muslims and Christians in the same way. So the second book, the Holocaust Lie does not belong to Mr. Adnan Oktar. Another person he knows, his name is Nuri actually, Mr. Adnan Oktar sent him a notification through the Notary and stopped the publication of this book. He(this person) used the pen name Harun Yahya in this book. He(this person) used a similar cover, and Mr. Oktar stopped the publication of this book and he published another book actually, the Holocaust Violence. Of course the Holocaust happened, everybody knows that. There are thousands of documents about that; Hitler slaughtered 6 million Jews at that time. I have been to the Holocaust Museum in Israel actually, I have seen the documentaries. It is terrible, even if one Jew, an innocent Jew was killed, this is terrible, think 6 million Jews were killed, it is a big Holocaust that happened at that time. And he [Mr. Oktar] published a book, and he has a website about this also. Of course he is against Holocaust, it is haram according to the Qur’an, you can not do that. So second book does not belong to him, his book is Holocaust Violence, in this book he explains the Holocaust with all its documents and he denounces that act which is against Islam. And he stopped the publication of the other book. Jews are again the People of the Book, according to the Qur'an and they are very religious people. Mr. Adnan Oktar says the reason why many countries – Muslim countries- in the Middle East became more religious is Israel. They saw the Jews, their being very, very religious, I mean by seeing Jews being so religious, they became religious after that. So Mr. Adnan Oktar says Israel became a very good example for the Islamic world in terms of that. And what about the relationships between Islam and Christianity? Dr. Oktar BABUNA: Christians are also called the People of the Book, according to the Qur'an. And God says that they should be treated with love, respect and compassion. We can socialize with Christians and Jews, and Muslim men are allowed to marry Jewish and Christian women. In fact Prophet Muhammad (pbuh) had both a Jewish and a Christian wife. Radicals, extremists actually never talk about this and also there was a Constitution at the time of our Prophet Muhammad (pbuh). It is called the Medina Constitution. It is one of the first constitutions in the world. According to this Constitution which was prepared by our Prophet (saas), Muslims, Jews, Christians enjoyed the same rights, they had equal rights with the unbelievers. So they were under the protection of Muslims, their security was under the protection of Muslims, they had equal rights. This is the way Islam was. Even the unbelievers had equal rights. Of course, democracy is in the essence of the Qur'an actually, ‘there is no compulsion in religion’, God says. So we will live together in peace until the Last Day. Israel will definitely exist as an independent state, having the right given by God actually. Every Muslim has to accept this and respect it. Together with Christians and Muslims, of course. - Your Association strongly fights against terrorism. What do you think about ISIS or the so-called Islamic terrorism of last year? Dr. Oktar BABUNA: Mr. Adnan Oktar has a book about this actually, this is the Italian version. These books are in 73 languages. Islam Denounces Terrorism. In that book he gives very powerful evidence from the Qur’an, (explaining) why you cannot kill innocent civilians. As you know the definition of terrorism is violence committed against non military targets, against civilians for political purposes. Only, if you ask to a terrorist, why do you kill these people because they say they are “others”. So there is no justification, for terrorism or killing innocent people in the Qur’an. In fact, God says, killing one innocent person is like murdering entire humanity. This is the same as Judaism actually which revealed to Prophet Moses also. So, suicide is unlawful, God says do not kill your self in the Qur’an. But these people learn these superstition. There are, as I told you, fabricated hadiths. Hadith means saying of the Prophet. So they say there are published books and these books are published in the entire Islamic world, (claiming to be) the sayings of the Prophet. And the (so-called) sayings of the Prophet in these books are full of violence, which is against Islam. Prophet never said these things, because they were generated two hundred fifty years after the Prophet passed away. And God says in the Qur’an; “Qur’an is sufficient”, (He says,) ”We did not omit anything in the Qur’an.” And killing innocent people is definitely haram. So is terrorism of course. They for example go to a shopping mall and bomb this shopping mall. What happens in September eleven attack? Innocent Jews innocent Muslims and innocent Christians and innocent unbelievers died in the 9/11 attack or in any terrorist attack. In the Qur’an God says that it is torment. You cannot do that. But they say - as I told you these superstitions are full of violence- that there are death penalties to who doesn’t pray, who doesn’t fast, who drinks alcohol. There is no such thing in the Qur’an. So what needs to be done is we have to educate these people, because if they are educated for radicalism in their families, in the schools, all over the Islamic world. 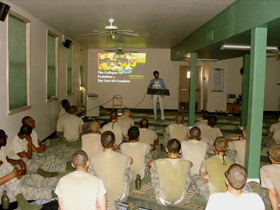 So we have to do a counter education based on the Qur’an. And this book does that actually. In this book Mr. Adnan Oktar gives the evidence of why their belief which is based on the (fabricated) hadiths is wrong with the Qur’anic evidence. You cannot do that. So military solutions are not a solution. Bombing these people, killing the radicals, civilians mostly suffer from that. Many innocent people have been killed. And of course it generates more hatred. Violence generates more violence. It is like a vicious cycle. We have seen this. For example United States was in Afghanistan and Iraq. 7 trillion dollars were spent, 3 million people were killed, there are casualties from the United States also. What happened? Taliban is very powerful, still very powerful, Al-Qaida is still there and ISIS has emerged. So militarily, you cannot solve this problem. Actually it increases, it feeds terrorism. Because if you bomb and invade a country, and these two countries are destroyed of course, so what happens is, it generates more hatred and they find more radicalism, more terrorists actually. What needs to be done is, counter education. Educating the entire Islamic world. So we can remove the source of radicalism and violence, by removing this bigotry and superstition. So this is the only solution. There is no other solution. But we need to ally in that. Christians, Jews and even unbelievers, through media, media campaigns, web sites, books. This is the only way. Imagine what would happen with 7 trillion dollars. With 7 trillion dollars, if United States were to publish books, open web sites and TV campaigns this would be eradicated completely from the world. And their ex-soldiers from United States in Afghanistan. There are 60 thousand homeless people, 50 thousand of them are ex-American soldiers. So by killing these people, they had psychological problems, they became addicted to narcotics. And every twelve minutes, an ex-American soldiers from Iraq and Afghanistan kills him self. So everybody suffers from violence and terror. Let’s stop this altogether and spend these trillions of dollars which go to weapon industry in to industry and the welfare of the humanity. But we are very hopeful. It is difficult, yes, but it is doable. Peace and security will prevail the world. Because God will do it. In the next five or ten years, the world will change, with peace and security, we will all live in peace and security will prevail the world. Good morality will prevail the world. We will see these days. 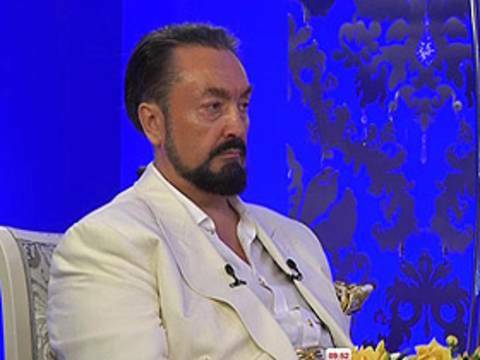 - Adnan Oktar expressed himself against Darwinism and homosexuality. What is your thought about the relationship between religion and science and religion and democracy? 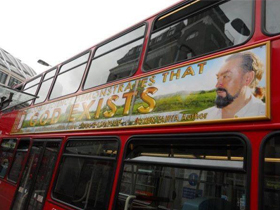 Dr. Oktar BABUNA: God orders science. Because science is created by God. What are the laws of science? Laws of science are the laws of God. Because science is created by God. For example, the law of gravity, the law of thermodynamics. Why? Because there is a harmony and organization in the nature and humans looking at this generate science. So science is created by God actually. By looking at science by thinking about the scientific evidence from the atoms, inside the cell, the protein production we know the existence of God. We see the Artistry of God. So science is a must. 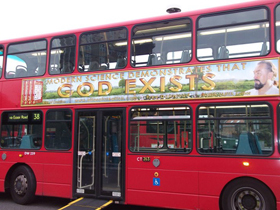 Every Muslim, every Christian, every Jew, everybody has to study science. By studying science, we see there is an Omnipotent Intelligence Who generates these delicate harmony and organization in the nature. And this is a must. So the second thing is, Darwinism is not science. Because when we look at the origin of life. I’m a medical doctor, I’m a scientist actually. 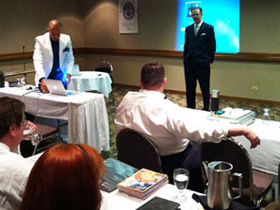 And I have given more than thousand conferences in all around the major universities, in the United States, Europe, Israel, Tel Aviv Hebrew University, New York University, I’ve have been in Oxford University for three times, Cambridge, Imperial College of London, many major universities in the world, about these scientific issues. So science tells us that a single cell is more complicated than the largest city in the world. There are about ten billion protein molecules, DNA, all the organelles. There is a complete living cell, more complicated than largest city of the world. There are protein molecules inside the cell. Even a single protein molecule to exist by chance, by random events as Darwinism claims in the nature is impossible. Zero (possibility), impossible. Because, proteins can only be produced by enzymes by other proteins inside a living cell. So living cell must exist first, everybody, all scientists accept this actually. And than it can produce the protein molecule. This is a fatal blow to Darwinism. Because they say, life originated by chance, science tells us ‘no its impossible’. It can only be created. The living cell must be created and then it can produce the protein molecule. The second thing is, evolution claims that species evolved to other species randomly and gradually. That’s what Darwin claimed actually. One species to another one. For example they say, the sea animals, the fish gradually transformed in to land animals over hundred millions of years randomly through mutations and through natural selection. So we have to see these transitions in the fossils, fossils are the remnants of the living things that lived in the past. But we have seven hundred million fossils today. When we look at the fossils, we see species appear abruptly, complete and perfectly formed. That is sudden creation, we don’t see any transitions. And scientifically and logically it is possible. Because the genetic code is extremely complex. There is no mechanism which can transform the genetic code gradually to other genetic codes. For example it is impossible for a gill of a fish that can live in the water, to be transformed gradually into a lung. Because any mutation, random change in the DNA will make this gill dysfunctional and the fish will die. Everybody knows that. If you take the fish out of the water, it dies. So we don’t see half-fish half-reptile, half-reptile half-bird fossils. None of them exists. Mr. Adnan Oktar said, “I will pay 2.5 million euros to anybody in the world –that was in the world media- who will bring one, 1- fossil which is a transitional form.” No body could bring it. None of them exist. Darwin says this actually, in his book. He says that there are no transitional forms. If there are no transitional forms, that means there is no evolution, of course. But life to originate by chance, the living things, is impossible, illogical. There must be a Creator. For example this pen has a design. My watch has a design. This has a purpose, of course a glass to drink water. And this book is written by an intelligence. And than claiming that life doesn’t have a purpose and it is a random occurrence; this doesn’t make a sense. So that’s the reason why we scientifically struggle. But there is another important issue with the Darwinism is, it has a social impact. If you put this subconscious mind of the people: “You are a fighting animal. You have to fight for survival. But if you are strong, you will survive, if you are weak you will get eliminated. In order to survive you have to crush the weak individuals.” That is what Darwinism brought actually, Darwin defends this idea. He got this from Thomas Maltus actually, it is called social Darwinism, applied into the societies, (saying) “you a fighting animal”, “survival of the strongest one”… Then of course it inevitably leads to fascism, to communism and irreligious ideologies and violence and conflict. Do you know what Hitler said? Hitler was a very powerful Darwinist, and he said: “take away the Nordic Germans, nothing will remain but the dance of the apes.” So he was a racist because of Darwinism. Darwin said this is a biological issue. And than he did the holocaust and he tried to kill the Jews and other races, to eliminate them from the Aryan – this so-called supreme- race. - But Darwinism is an accepted theory by the scientific community worldwide. Who have the power to decide what is science, or not: scientists or politicians and religion? Dr. Oktar BABUNA: Well, Mr. Adnan Oktar is very democratic in that, he says evolution should be thought in the schools in a broader way, but also the scientific evidence which refute evolutionism, the fossil evidence, impossibility of the proteins formed by chance, also should be thought in the schools. Communism should be thought in the schools, he believes. Fascism, he believes also Judaism, Christianity and Islam should be thought in the schools. Everybody should have a broad intelligence. Than they can decide, what is right and what is wrong. You cannot prohibit any ideologies or any scientific evidence to be taught in the schools. That is wrong. So Darwinism is being taught in the 200 hundred countries as a state ideology, all over the world. But the evidence, the fossil evidence are being prohibited which falsify Darwinism. That’s the problem. So Darwinism should be taught, we do not have any objection to that. Evolution should be taught in the schools but also the scientific evidence which refutes evolution should also be taught in the schools. That’s what Mr. Adnan Oktar says. So democracy is in the essence of Islam actually. You cannot prohibit any ideas, to be taught to the students, to the other people. - And what about the homosexuality? In a democratic country, aren’t the rights of minorities important? Dr. Oktar BABUNA: Homosexuality is unlawful, it is haram in the Qur’an, in Judaism and in Christianity in the Bible also; it is haram. So of course, Mr. Adnan Oktar never says “homosexuals should be beaten or oppressed or tortured”. He never said that but of course we have the right to spread what God says and we believe what God says and defend it. So the Jews have the right to tell that homosexuality is harmful according to Torah and Judaism. And the Christians have the right to tell this also. So since God says it is unlawful, of course we are against that. That’s the reason why we are against homosexuality. But it doesn’t mean that we want to go and torture and beat these people. I am not talking about this. But we have the right and we believe in that. We strongly believe in that. Since God says that homosexuality is unlawful. It is an ugly act, God says in the Qur’an. So we talk about this. Mr. Adnan Oktar talks about this. He believes in complete democracy, freedom of thought and freedom of worship. In fact, (right now) freedom of thought and freedom of worship is prohibited all around the world. Now there will be a very good days to come. These are like the painful contractions. You know in a birth, contractions, the density of the contractions increases, increases and increases, and the most painful part is right before the birth. We are getting close to this part. And after that a baby - a new era - will come, and it is very close by. We believe in that. So we will see that. It is testable, we will see. Future will be very good in the world, for Muslims, for Christians, for Jews and for everybody, for unbelievers also.